SOUTHAMPTON — Brian Chamberlin stood in front of a sixth-grade class and held up a metal squeegee. The tool saved lives on Sept. 11, 2001, he told his students at the William E. Norris School, when a maintenance worker used it to help people who were stuck in an elevator escape after a plane crashed into the World Trade Center. 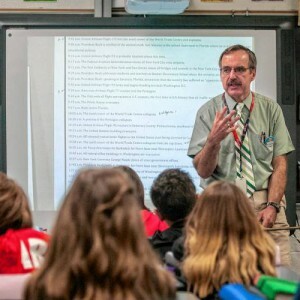 Chamberlin, a social studies teacher, has been teaching students about the Sept. 11 terrorist attacks for the past 15 years. But as the years go by, more and more students know less and less about the events, Chamberlin said. “I just want them to remember it,” he said. On Monday, he started the class by asking students what they know.